Author markusPosted on March 29, 2011 March 30, 2011 Categories It's funny - laugh!, Random stuffTags awesome, shooting, YouTubeLeave a comment on Happy 1911 day anyone! 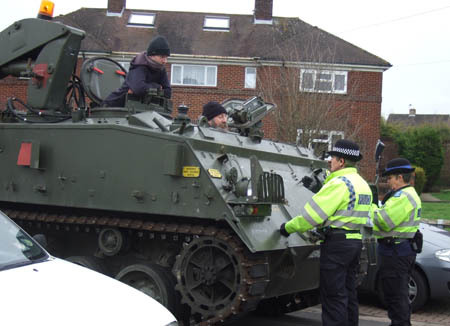 Furious residents living in a quiet village have blasted a madcap neighbour after he bought a TANK — and parked it outside his home. Military-nut Nicholas Kravchenko is now refusing to move the four-tonne camouflaged beast which came complete with caterpillar tracks. Residents living in the normally tranquil St Peter’s Road in Wolvercote, near Oxford, have branded the machine an ”eyesore”. But Mr Kravchenko – a retired Army engineer – has refused to move the tank which takes up three-and-a-half normal parking spaces. Yesterday he stormed: ”I can go out and drive it any time I like. There’s no law to stop anyone having 10 tanks. 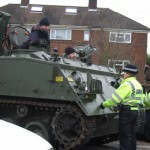 ”The council have not said it’s antisocial and the police would have been straight on to me if it was parked illegally.